It’s no secret Jeff Bezos has been looking to crack health care. But no one expected him to pull in Warren Buffett and Jamie Dimon, too. News Tuesday that Bezos’s Amazon.com Inc., Buffett’s Berkshire Hathaway Inc. and JPMorgan Chase & Co., led by Dimon, plan to join forces to change how health care is provided to their combined 1 million U.S. employees sent shock waves through the health-care industry. The plan, while in early stages and focused solely on the three giants’ staff for now, seems almost certain to set its sights on disrupting the broader industry. It’s the first big move by Amazon in the sector after months of speculation that the internet behemoth might make an entry. The Amazon-Berkshire-JPMorgan collaboration will likely pressure profits for middlemen in the health-care supply chain. It was enough to sink health-care stocks. 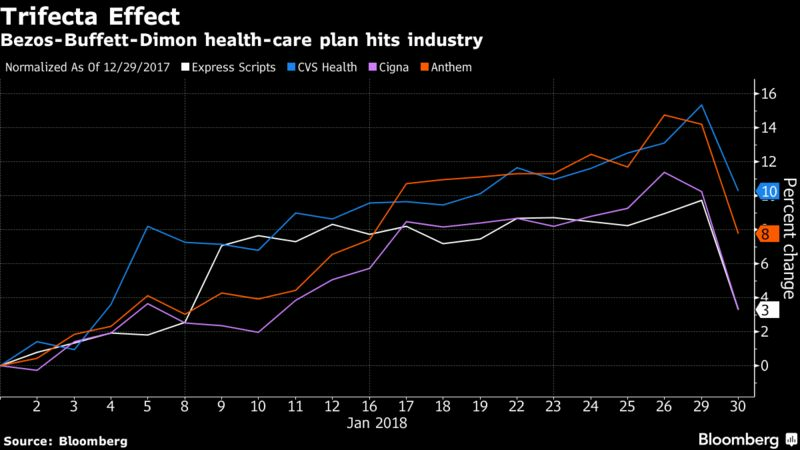 Express Scripts Holding Co. and CVS Health Corp., which manage pharmacy benefits, slumped 6.9 percent and 4.9 percent, respectively. Health insurers such as Cigna Corp. and Anthem Inc. and biotechnology companies also dropped. The group announced the news in the very early stages because it plans to hire a CEO and start partnering with other organizations, according to a person familiar with the matter. The effort would be focused internally first, and the companies would bring their data and bargaining power to bear on lowering health-care costs, the person said. Potential ways to bring down costs include providing more transparency over the prices for doctor visits and lab tests, as well as by enabling direct purchasing of some medical items, the person said. The initial focus of the new company will be on technology solutions that will provide U.S. employees and their families with simplified, high-quality and transparent health care at a reasonable costs. In the statement, JPMorgan CEO Dimon said the initiative could ultimately expand beyond the three companies. “Our goal is to create solutions that benefit our U.S. employees, their families and, potentially, all Americans,” he said. Amazon, Berkshire and JPMorgan are among the largest private employers in the U.S. And they’re among the most valuable, with a combined market capitalization of $1.6 trillion, according to data compiled by Bloomberg. This isn’t the first time big companies have teamed up in an effort to tackle health-care costs. International Business Machines Corp., Berkshire’s BNSF Railway and American Express Co. were among the founding members of the Health Transformation Alliance, which now includes about 40 big companies that want to transform health care. The group ultimately partnered with existing industry players including CVS and UnitedHealth Group Inc.’s OptumRx. The latest effort is being spearheaded by Todd Combs, who helps oversee investments at Berkshire; Marvelle Sullivan Berchtold, a managing director of JPMorgan; and Beth Galetti, a senior vice president for human resources at Amazon. Buffett handpicked Combs in 2010 as one of his two key stockpickers. 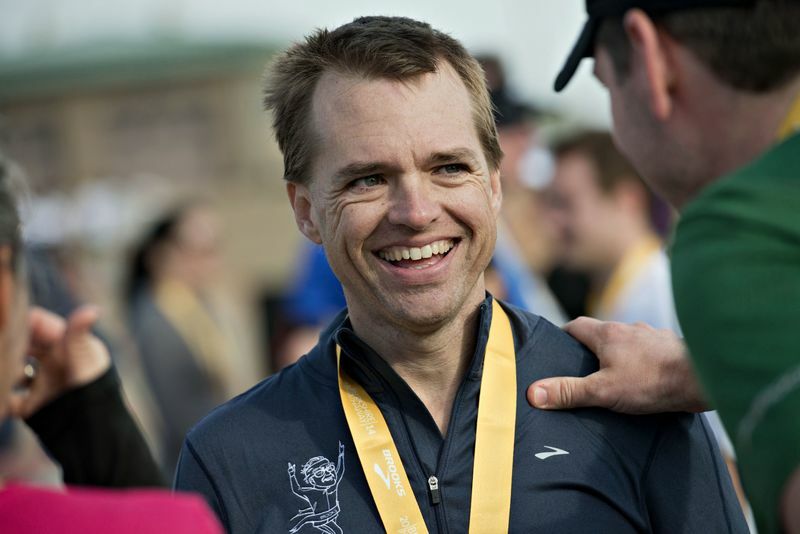 Combs, 47, has been taking on a larger role at Berkshire in recent years, and Buffett has said that Combs and Ted Weschler, who also helps oversee investments, will eventually manage the company’s whole portfolio. Combs also joined JPMorgan’s board in 2016. Sullivan Berchtold joined JPMorgan in August after eight years at the Swiss pharmaceutical company Novartis AG, where she was most recently the global head of mergers and acquisitions, according to her LinkedIn profile. One of the highest ranking women at Amazon, Galetti has worked in human resources at the e-commerce giant since mid-2013, becoming senior vice president almost two years ago, according to her LinkedIn profile. As of late 2017 she was the only woman on Amazon’s elite S-team, a group of just over a dozen senior executives who meet regularly with Bezos, according to published reports. Previously Galetti worked in planning, engineering and operations at FedEx Express, the cargo airline of FedEx Corp. She has a degree in electrical engineering from Lehigh University and an MBA from Colorado Technical University. Health-care spending was estimated to account for about 18 percent of the U.S. economy last year, far more than in other developed nations. Buffett has long bemoaned the cost of U.S. health care. Last year, he came out in favor of drastic changes in the U.S. health system, telling PBS NewsHour that government-run health care is probably the best approach and would bring down costs. When you lie on a resume and still get the job.